Cut the eggplant into 1/8-inch thick slices. Wet both sides of the eggplant slice with lemon juice, to stop the oxidation of eggplant. Mix gram flour, salt, baking soda, cayenne pepper and coriander powder in a bowl. Add in the water, little at a time. Mixture should have the consistency of pancake batter. Heat the oil over medium heat, in a large frying pan. Oil should cover bottom of the pan and be approximately 1/8-inch in depth. Take 5-6 eggplant slices and dip them into the flour batter. Make sure to coat both sides of the eggplant well. Place in hot pan and fry both sides until golden brown. 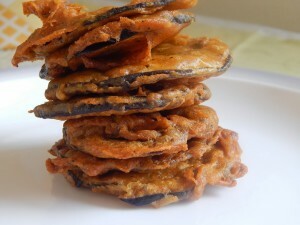 Place the fried eggplant pakoras on a kitchen towel to absorb excess oil. Serve hot eggplant pakoras with mint chutney and tomato ketchup.